While some types of food last longer than others, most food will go bad eventually, even if stored properly. You'll need to use your senses to determine if food has spoiled. Even if the food appears to be edible, you'll also need to use some common sense, based on the expiration date of the food and how you've stored it, to determine if it's actually safe to eat. 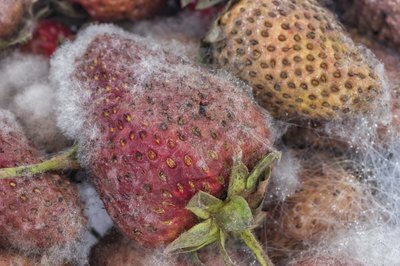 Visible mold growth and changes in the color and texture of food indicates spoilage. With the exception of hard cheeses, some types of salami, dry-cured country hams, and firm fruits and vegetables such as cabbage, bell peppers and carrots, you can't cut away mold spots, warns the United States Department of Agriculture (USDA). While mold might appear to be confined to one spot, its filaments can penetrate deep into the food, where you can't see them. Mold spores release mycotoxins, which can make you sick if you eat them. After visibly inspecting your food for mold, sniff it to see if smells bad. If your food smells unpleasant, it's likely spoiled. Don't try to smell visibly moldy foods because you could inhale the mold spores and experience an allergic reaction, warns WebMD. The microorganisms and enzymes that cause spoilage break down the food over time, producing a foul odor. Foods that contain any type of fat also react with oxygen to produce very smelly carbon-based compounds, indicating spoilage, according to FoodSafetySite.com. When microorganisms break down food, they make it taste unpleasant. If your food looks and smells OK, taste it but don't swallow it. Spoiled food tastes sour, bitter or fermented. Spit out the food that tastes foul and rinse your mouth with water to avoid ingesting any harmful microorganisms. Spoiled food not only tastes bad but it may also have a slimy, squishy or mushy texture when you cut into it. 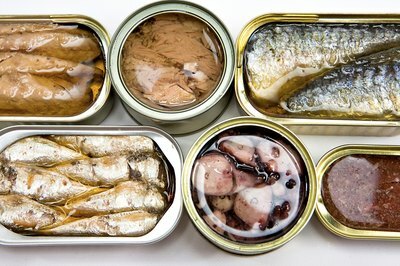 Never taste spoiled canned food, which typically appears bloated, moldy, discolored or foamy. It could contain a deadly bacteria called Clostridium botulinum. Discard spoiled canned food in tightly closed plastic bags and clean any spills with bleach, recommends the Centers for Disease Control and Prevention. While negative changes in your food's appearance, odor, texture and taste are all signs of spoilage, sometimes food that looks and tastes fine can still contain harmful pathogens. If you leave out foods that require refrigeration, like dairy, meats, fish and poultry, for more than two hours in ambient temperatures above 40 degrees Fahrenheit, they will develop harmful pathogens that are tasteless, odorless and colorless, warns the USDA. Keep perishable food in temperatures below 40 degrees or frozen at 0 degrees. Note that cooking spoiled food, whether it appears OK or not, won't make it safe to eat. Unlike an actual expiration date, the "best by" or "sell by" dates only indicate when the food will be past its peak of freshness. After these dates, the food may not immediately go bad, so rely on your senses to determine if it's spoiled. Regardless of the expiration date, food stored improperly is spoiled and should be discarded, even if it seems fine. 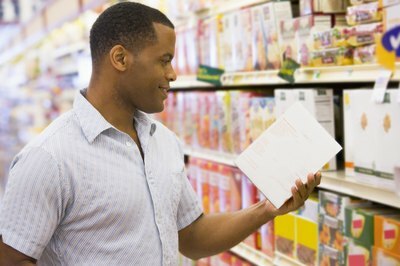 WebMD: Do Food Expiration Dates Really Matter? Tufts Now: Are the Bacteria that Make Food Smell and Taste Bad the Same Ones that Make You Sick? If your chicken broth has gone bad, you'll likely notice unpleasant changes in its appearance, texture, taste and odor.